At the time that this article was written (January 25th, 2019), the partial shutdown of the US federal government had entered its 35th day. This is the longest partial shutdown of the US government in the history of the country, easily surpassing the 21-day shutdown that took place during President Clinton's first term in office in 1996. Partial government shutdowns are a relatively new phenomenon, as the first time that government workers were furloughed took place in 1980. In 1980, then Attorney General Benjamin Civiletti determined that the head of an agency could only avoid violating the Antideficiency Act by suspending the agency's operations until an annual or temporary appropriation bill was passed. He would later issue a second opinion that would allow for certain agencies to continue operating during a partial government shutdown in order to protect human life and property, though these workers would remain unpaid. Members of Congress continue to draw a salary during any partial government shutdown, as a change in their salaries can only be implemented through a change in law. 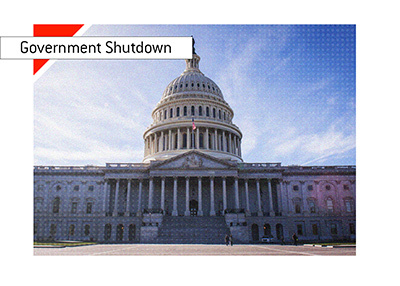 Partial government shutdowns occur when the President and Congress can't agree on a bill to fund government. Both the House and Senate must vote on and pass an appropriations bill to send to the President, and the President must agree to sign the bill, or else it will be returned to Congress for further deliberation. A President's vetoed can be overruled, but only with a 2/3rd majority vote. Previous government shutdowns have occurred over disagreements over tax increases, budget cuts and "Obamacare". The 2018-19 government shutdown, which is the longest in history, took place when President Trump and the Republicans requested $5.7 billion for the building of a wall on the Mexico/US border. Democrats have refused this funding request, with the party pointing out the situation with the country's "Dreamers" still hasn't been dealt with, plus they had questions over the effectiveness and cost of the wall. President Trump threatened to declare a national emergency in order to get the wall built, citing national security concerns, though this hasn't happened as of yet. As a result, hundreds of thousands of employees are still furloughed. Workers at agencies considered non-essential are furloughed, while other workers at agencies deemed essential are continuing to work with no pay (they will receive back pay when a deal is finally signed). There is real damage done to the economy during a partial government shutdown. The last lengthy government shutdown, which took place in 2013, reportedly cost the government $2.1 billion and shaved up to 0.6% off of the GDP for that quarter. According to Standard & Poors, that shutdown took an estimated $24 billion out of the economy. There is also political damage that is done during a government shutdown. Many credit the 1995-1996 shutdown for putting President Bill Clinton back in office for a second term, as the majority of Americans sided with the Democrats in the dispute. The House of Representatives, Senate and President (unless he is overruled via supermajority) must all agree on an annual or temporary appropriations bill in order to avoid a government shutdown. With the country seemingly becoming more polarized by the day, the frequency of government shutdowns will likely continue to increase in the future.